3rd & Chestnut, Bunbury Theater (my stop). I take the express route 66X from a Shepherdsville Park & Ride lot to downtown Louisville. (You can see our route in the bottom-right inset of the system map.) I leave my house around 6:50 a.m., board at 7, and get off in front of my office building at 7:37. The ride home is a little longer, clocking in at 46 minutes long from my stop downtown to the Shepherdsville lot. I usually take the 4:31 p.m. bus, but I’ll sometimes wait for the 5:11 if I’m working overtime or can’t make the earlier bus for whatever reason. I’m glad that the morning ride is shorter as I’d hate to get up as early as the Mt. Washington riders (first stop is at 6:34 a.m.). Many of the perks of bus riding are obvious: you save gas, you cut down on daily wear and tear on your car, and you generally don’t have to worry about road rage. It’s nice to know that we are not only saving the Earth (Lou even has a few hybrid buses), but we are cutting down on traffic by taking public transportation. The city could save a few billion dollars by adding more bus routes to Indiana instead of building more bridges and interstates across the river. 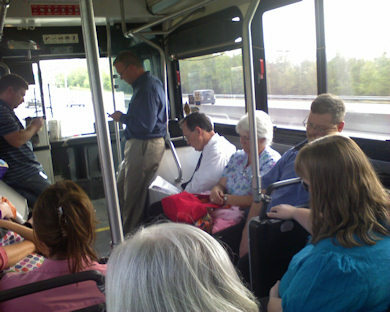 On the bus, you can read or get some work done. It’s a lot safer to be on the bus in bad weather conditions and it’s nice to be able to watch the sunrise or see what else is going on outside during the commute. I’m a night owl, so I rarely get the daily recommended amount of sleep. It’s quite easy to nap on the bus. Somehow, I always manage to wake up by the time my stop comes around. From the way the bus leans, I could tell you what corner we’re on with my eyes closed—maybe my body gyroscope knows when to wake up. I’ll also set an alarm on my phone, or just ask the person next to me to wake me up. I tend to sway a little and tip over when I doze off, though. Hopefully people don’t get too mad at me for leaning into them. I’ve mentioned how much I enjoy catching up on podcasts during my ride, but the regular crew I ride with is a friendly bunch if I want to be involved in the conversations around me. On the other hand, sometimes they’re a little too talkative. Plus, the sound of the engine on the bus itself is so loud that I can’t hear what Diane Rehm (the NPR daily show) is saying on my headphones. My phone isn’t loud enough for me to hear people, either, but calls can usually wait until I’m off the bus. 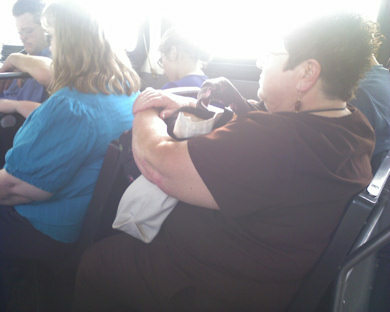 Being cold-blooded, I’m always… cold on the bus. In the summer, the A/C is usually way too cool. In the winter, my feet never warm up; I have to defrost with a space heater when I get to the office. On a related note, while waiting at the stop in bad weather is unpleasant, it builds solidarity with fellow bus riders! The seats are surprisingly comfortable (typical city bus style), although I wouldn’t want to sit in them for more than an hour. Some people are pretty good at avoiding eye contact with oncoming passengers as they sit in an aisle seat—there are several women who get away with reserving two seats like this for themselves almost every day. There are other occasional unpleasantries (urine smell, body odor, standing-room-only, or being squished between passengers), but I’ve only come across any of these once or twice a month, if that. Fortunately, I’ve never witnessed any unruly passengers and only once has the bus been more than 10 minutes late. Some of the seating doesn't leave much leg room. Probably my least favorite aspect of bus riding is the inconvenience of not being able to run errands or go out after work. I either have to plan to drive in or replace my lunch break with a trip to the bank or the library so I can catch the bus in time. It’s also inconvenient to carry more than a small lunch bag, particularly if there’s a pot luck or if I need to bring something to change into. Overall, the pros outweigh the cons (of course—otherwise I’d be driving). The monthly pass previously cost $42, but it was bumped up to $80 in July. Go figure, July was the first full month that I started riding. One-way express fare is $2.50. The pass gives me access to any route at any time, although I’ve never used it for anything else. The trolleys that drive around downtown are free—they’re the only other form public transport I’ve used in Louisville (there are no trains or subways, so I guess that’s all they have anyway). I’m lucky to have a bus route that practically takes the same amount of time for to me to drive in my own truck—I’d say that’s probably the make-or-break reason to take the bus (proximity to stops). I literally only save 10–15 minutes when I drive instead of ride. Random song of the week: The Decemberists: The Hazards of Love 1. They did a great show at SXSW 2009 that NPR taped; see particularly The Wanting Comes in Waves. Go figure. The day after I blog is the day that our bus breaks down in the morning. I drive up to our Park & Ride lot only to see a car loaded with people. They inform me that the bus had broken down and would be at least 30 minutes late. One thing I didn’t mention in my post is that people at our stop have the phone numbers of people that get on earlier in Mt. Washington, so we’ll get updates about why a bus is late. I’m always one of the last to arrive at our stop, so most people had already carpooled out of there. I hate it when I have to drive in unexpectedly, but I’m grateful that I wasn’t on the bus yet—bummer for those who got stuck on a cold, broken-down bus! This actually reminds me of a similar incident a couple weeks ago. 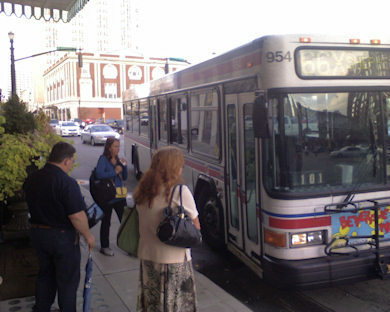 The bus typically stops three times before it gets to 3rd & Chestnut in the morning. On this cold morning a couple weeks ago, it pulls up to the 3rd & Ali stop (one before my own), kneels (when the hydraulics lower the bus to make it easier to step up), lets people off, and then unkneels. Then it proceeds to kneel and unkneel several more times. I don’t know what was wrong, but I requested to get off after a minute of those shenanigans. I often get off at this stop anyway when the weather is pleasant. It’s only a 3-4min walk to my office; normally, I get off almost directly in front of our building. I never saw the bus pass by during my walk, so who knows how long it took to resolve that issue!